Restaurant openings by TV foodie types are often accompanied by the sharpening of knives over at The Papers but an imaginative review with all the right ingredients can sometimes be let down by the execution. The recent hammering given to Gregg’s newest venture by the Telegraph was probably deserved but the flavour was ruined by some noticeably laboured jokes. 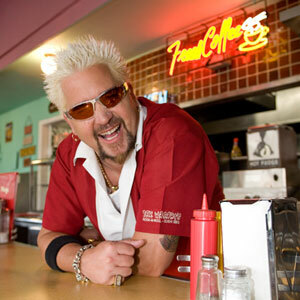 Diners, Drive-ins and Dives are Fieri’s domain and in his broadcasting job he tirelessly documents and demonstrates an American cuisine that’s grilled, smoked, deep fried and topped with melted cheese. His culinary empire includes the Tex Wasabi chain built especially for those who like the idea of sushi but wish it contained more brisket. This is a chef so Off. The. Hook. that he was Smash Mouth’s first choice when they needed a bro to cook some eggs. All this makes him a fairly easy target for the refined critical palates of the NYT and there’s more than a hint of snobbery on display. The points are well-made though and, much as I love diners, burgers and BBQ, a 500-seater mega restaurant in Times Square strikes me more as a machine for raking in tourist dollars rather than an ideal place to experience the best in all-American cooking. If your restaurant can’t even get nachos right, what are you playing at?